The bronze equestrian statue of General Sam Houston is the most iconic piece of Houston civic art. It has stood in the traffic circle just inside the entrance to Hermann Park since its unveiling on August 16, 1925. It stands on a gray granite arch constructed by Frank Teich (1856 – 1939). The general points from atop his horse, Saracen, toward the plains next to the San Jacinto River where he ultimately defeated the army of Mexican General Antonio Lopez de Santa Anna, winning independence for Texas. Enrico Filiberto Cerrachio created the sculpture in 1924 after it was commissioned by the Women’s Club of Houston. The Club raised the funds for the Sam Houston Monument after a March 1, 1917, newspaper article called for a monument to the founder, first president, and first governor of Texas. The statue is a colossal, chased surface, equestrian bronze sculpture on a granite arch. The inner walls of the arch sport bronze plaques and are lined with small ceramic tiles. The circular plaza surrounding the arch is paved with multi-colored, broken rubble marble tiles. Cerrachio was born in Italy in 1880 and studied at the Institute Avellino. He immigrated to the United States in 1900, settled in Houston, and became a U.S. citizen in 1905. He worked largely in bronze and marble, creating many sculptures of historical figures. 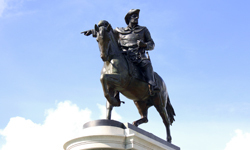 The Sam Houston Monument is by far the most widely recognized of his local works. He died on March 20, 1956. In 1996, the Houston Municipal Art Commission undertook the restoration and maintenance of all Houston civic art. 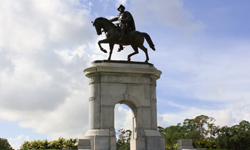 Due to its very visible place in local culture, the Sam Houston Monument was chosen as the first project under this program. Its restoration was unveiled in September 1996. That year, Bunker Hill Elementary School adopted the conservation of the statue and its students have been involved with raising money for the upkeep and restoration of it ever since.